It would be interesting to consider how many excess houses were built between 2003 and 2006 relative to the LT moving average (looks like about 600,000 or so by eye, and perhaps even a few more from 1997-2003), and how that compares to the deficit over the last couple of years…are we back to neutal in net after the buidling binge or down a bit? 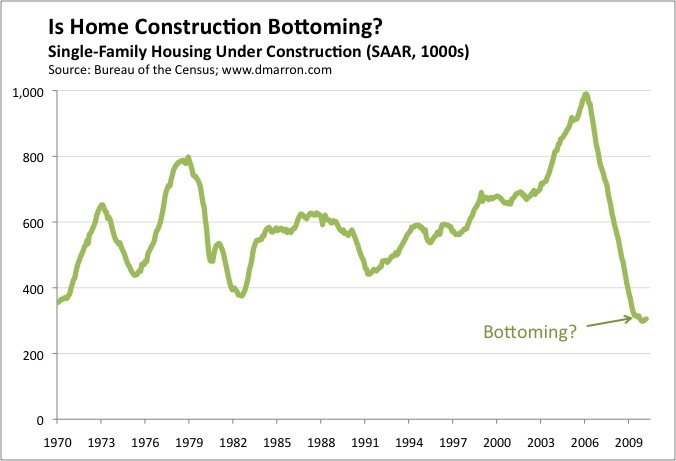 And how does the average (net if possible of housing leaving the base housing stock) compare to demographic growth, and what does that require in terms of increased rate of home ownership for the equation to balance? I’m not sure that a change in the interest rate really changes the number of housing units we consume. I think it changes who owns the unit (landlord or resident) but not the total number of units.